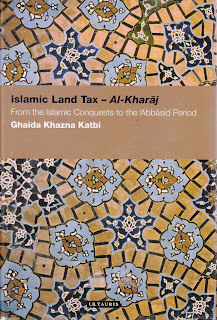 Reading "Islamic Land Tax - Al-Kharaj : From the Islamic Conquests to the 'Abbasid Period" by Ghaida Khazna Katbi (2010). I am quite interested in the late Roman Empire and Rashidun period of the Middle East as there is a sense of massive change in what was before and what came after. At 629 AD the Eastern Roman Empire had just survived the Byzantine-Sassanid Wars, restored the true cross of Jerusalem and was the ascendant power in the Middle East and Eastern Europe with major in roads to Italy and the Visigothic Kingdom of Spain. After the Battle of Yarmouk in 636 AD the Eastern Roman presence in the Middle East ended and over the period of centuries the resulting conflict between the resultant political entities culminated in the Crusades and the capture of Constantinople by the Ottoman Turks in 1453. In history what tends to be lost from the record is the experience of everyday people living their lives, archaeology is part of the process of investigating this, the issues they faced and the solutions they found to these issues. The first chapter of Ghaida Khazna Katbi's book, is titled the "Systemisation of Taxes under Umar bin al-Khattab". Umar bin al-Khattab was the second caliph of the Rashidun Caliphate (ruling from 634 - 644 AD), who continued the wars of expansion while laying down the political foundations of the state, he set up the state apparatus for government and taxation and the toleration or maintenance of the culture of subject peoples in the conquered territories. During the conquest period commanders imposed a jizyah tax on non-muslims that was independent of land. The soldiers (muqatilah) during the conquest period saw much of the conquered land as spoils of war, while the Rashidun caliphate, in an effort to minimise harm, saw that the conquered land was left as the property of its original owners, who paid a kharaj, a land tax. These agreements were later systematized with distinctions between cultivated and uncultivated land, which bears a similarity to the Byzantine tax on head counts (tributum capitis) and tax on land (tributum soli) (Khazna Katbi 2010 : 31). By the 5th century AD Eastern Roman taxes on land, head count and property had merged to one tax, the iugum. The two seperate taxes imposed by the Rashidun caliphate emerged from the Islamic concepts of jizyah and fay, jizyah on head count of non Muslims and kharaj on the land (Khazna Katbi 2010 : 32). In the Byzantine state peasants were linked to the land, as serfs, and taxed as part of a unit of land, thus in essence were property of the land owner and in service to the land owner. This seems similar in essence to slavery and thus the Rashidun Caliphate in considering them as free men, with an independent tax, may go to some degree in explaining the rapidity of the fall of the provinces of Syria and Egypt to the Rashidun Caliphate. Chapter 2 Tax Measures under the Umayyads (661 - 750 AD). Details the decrease in labor in Basra, movement of peasants (fallahun), plague and attempts to increase agricultural productivity. The Islamic dinar equaled the weight of the Byzantine solidus circulating in Syria, fixed weight of the dinar at weight of mithqal to prevent exploitation by tax collectors (Khazna Katbi 2010 : 77). Chapter 3 Taxation under the Abbasids (750 -1258 AD). Systematic influence of jurists (fuqahau), ministers (wuzara) and state officials (kuttab). Assessment of land in terms of its productivity (muqasamah), a proportional share cropping assessment system introduced instead of land area (kharaj). Around 786 -808 AD there was a desertion of great landowners from their estates in Palestine (Khazna Katbi 2010 : 127), it is theorized this was because of the kharaj imposed. New people were introduced and some of the lands were returned to the original owners. In Damascus there was a revolt, lead by Abu al-Haydham al-Murri, over seven years during 786 -793 AD. The cause of the revolt is complex, it is seen as related to ownership of land around Damascus that had fractured along tribal lines, the Yamani controlled access to water and were forced by the state to distribute it, but further conflict arose. The rebellion can be characterized as a conflict between the semi-Bedouin Qaysi tribe and the rural Yamani tribe. Most of the tribes united behind the Qaysi tribe to expel or bring under control the rural Yamani tribe. Attempts at reconciliation were made, the state enticed the Yamani with wealth and equipment, the Yamani interpreted this as support for them by the state. The Yamani burnt Qaysi villages, the Qaysi retaliated and drove the Yamani tribes to a place called Bustan Atikah. Abu al-Haydham was successful in countering and opposing the Yamani raids, villages approached him for protection, a guarantee was made, the agreement describes the necessity of a unified effort to deal with common dangers and problems (Khazna Katbi 2010 : 130), this agreement was not acceptable to the state and thus the tribal conflict became a rebellion. The governor of Damascus mobilized his army, of around 12000, to oppose Abu al-Haydham, besieging him at al-Bab al-Sharqui, the state army's general al-Adhafir was killed and thus attempts at reconciliation were made between the state and Qaysi. The Yamani of Homs exploited the peace negotiations to raid villages and attack the Qaysi. The Qaysi response was violent, following the Yamani to the forts of Harlan and Habka and raised Yamani villages. The Yamani of Homs spread news of Abu al-Haydhams persistent disobedience to the state. The state used this as justification to create an army of around 20000 under the leadership of al-Sindi. Al-Sindi, from recommendations of a subordinate Bustam suggested negotiation with Abu al-Haydham, concessions were made and Abu al-Haydham withdrew 9000 horsemen to the village of Rawiya. The Yamani again attempted to incite the governor against Abu al-Haydham. The governor indicated the difficulty of military operations against Abu al-Haydham and is reported as saying "If you wanted to kill him, I would not have prevented you, but its best to avoid him. By my life, he is troublesome for you, so why don't you kill him" (Khazna Katbi 2010 : 131). The financial loss to the state of the rebellion was calculated by the loss of kharaj, damage to crops, devastation and plunder and the cost of military operations. Chapter 4 The Administration and Systemisation of Taxes. The discussion of the use of force in gathering taxes was discussed by tax collectors to the state, communication from the state involves ideas of proportional taxation, maintaining justice and only taking the surplus of wealth for the kharaj, being "kind" (Khazna Katbi 2010 : 182), although harshness in the collection of the kharaj was prevalent. Functions of the treasury included the maintenance and building of new canals and dams. The harshness of the tax collectors was a problem that surfaced in the mazalim courts, levying became severe in some regions and were associated with revolts and confrontation. Chapter 5 The Beginnings and Development of the Sawafi. As Muslims began to own land the revenue from the kharaj decreased for the state. Sawafi was all land that did not have an owner at the time of conquest and was initially considered fay (property seized by force) for the soldiers (muqatilah). During the Rashidun Caliphate conquest of the Sassanid Empire, Umar al-Khattab dividing the land owned by the factions allied to Khusrau the 2nd for the state taking one fifth and the muqatilah taking four fifths and this set up a precedent. The Muqatilah for operational reasons impounded the land and gave it to the supervision of governors, it became collective property with revenue distributed to the muqatilah, this was to facilitate continuation of military operations (Khazna Katbi 2010 : 234). Over time during the Ummayad caliphate it became a point of conflict between who owned the sawafi land, the muqatilah's governors or the caliphate, as the Sassanid concept was that the land was the property of the crown ( (Khazna Katbi 2010 : 238). As Muslims started to purchase land from the non Muslims (ahl al-dhimmah) this reduced the revenue from the sawafi and kharaj lands, The term taqabbul appears during the Umaayad caliphate sparsely, it refers to a cultivation contract between a liable Muslim and the state. During the Abbasid caliphate the idea of the states ownership of swafi land was firmly established and thus the swafi land became a stable source of revenue (Khazna Katbi 2010 : 258). Chapter 6 The Legal Foundations of the Kharaj. The kharaj was a land tax imposed on non Muslims, once a man converted the jizya, head tax was removed but the kharaj was continued . The basis for the imposition of the kharaj is based on the Quran "until they pay the jizyah by hand, and they are humbled (wa-hum saghirun) (from Qur'an, sural al-Tawbah (9:29) (Khazna Katbi 2010 : 279). It is argued by the Hanafis (a school of Sunni Islamic legal thought) and Malikis (a school of Sunni Islamic religious thought) that Umar al-Khattib used independent reasoning (ijtihad) on the basis of public welfare (al-maslahah al-ammah) in designating the conquered land as common property (fay), where the orignal owners retain possession in exchange for paying the Kharaj (Khazna Katbi 2010 : 277). Al-Shafii, a Islamic jurist from the Abbasid caliphate argued that land conquered peacefully (sulh), where the occupants paid jizyah, remained the occupants property even if they were paying kharaj, they had rights to the land. Land conquered by force (unwah) could be either divided or made common property (fay), deriving precedence from the Sunnah or policies of Umar al-Khattib. Unused land (mawat) could be revived and the type of taxation imposed was dependent on the Muslim or dhimmah status of its occupants. Over time the kharaj imposed was dependent on the productivity of the land. Ownership of land was created from iqta grants of mawat land or sawafi, granted by caliphs and governors to followers and supporters (Khazna Katbi 2010 : 300). The selling of unwah and kharaj land was generally disapproved by the Islamic law scholars of the time, but in reality the land was sold, at least until Umar the second, an Umayyad caliph (ruled 717 -720) who is associated with a number of legal and social reforms, including the removal of the jizya tax from converted Muslims. Chapter 7 provides the names and descriptions of the original sources, such as Amr bin Maymun who narrates Umar al-Khattabs taxation arrangements (Khazna Katbi 2010 : 316). In summary, the book uses original sources contemporaneous with the Rashidun (632 -661 AD), Ummayad (661 -750 AD) and Abbasid (750 -1258 AD) caliphates to detail the issues and solutions of the early Arabic states in raising revenue, and engaging in the development and maintenance of their infrastructure, while attempting to meet the demands of social justice as it was understood at the time. Although the topic of the book is about land tax, the al-kharaj, other forms of taxation are covered and my interest, as someone who does not have a government or legal background is the experience of ordinary people living in these historical societies. Khazna Katbi, Ghaida. (2010). 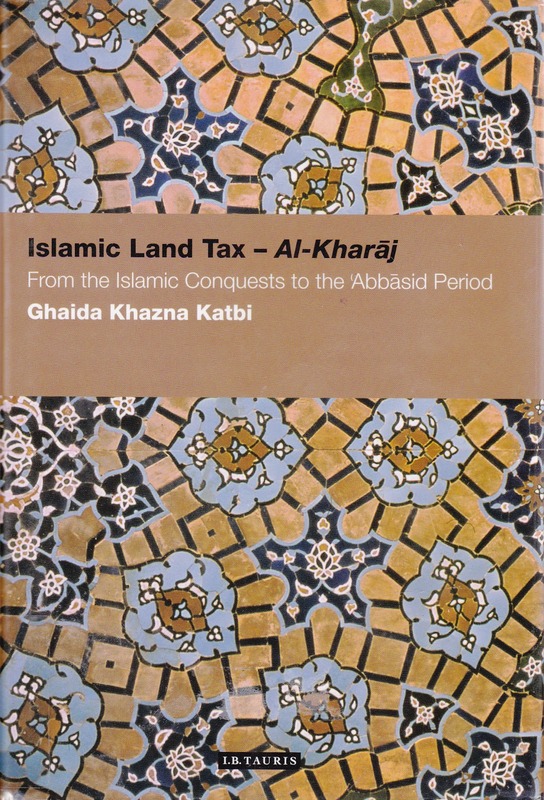 Islamic Land Tax - Al-Kharaj : From the Islamic Conquests to the 'Abbasid Period. Published by I.B. Tauris & Co Ltd. In Association with The Centre for Arab Unity Studies. Printed by CPI Anthony Rower, Chippenham, UK. 410 Pages.